We are now offering “hot stamp foil printing” on our vinyl bags. We are asked all the time about printing on bags for small quantities. We can and have screen-printed just one bag but this is generally NOT cost effective by any stretch! The reason for this is because there is a setup charge ( plate, film, etc. ) on small orders. There are times that we have customers needing one or just a few bags where budget is NOT a concern because of circumstances. No bag manufacturer could screen-print just a couple of bags without a surcharge to offset the cost incurred for setup. The only way someone could do this would be to “pad’ the price so high on an item that the cost for setup was already embedded within. When buying a bag that may be only $5.00 it would rather difficult to hide a $25.00-$50.00 setup on a single purchase of one item. 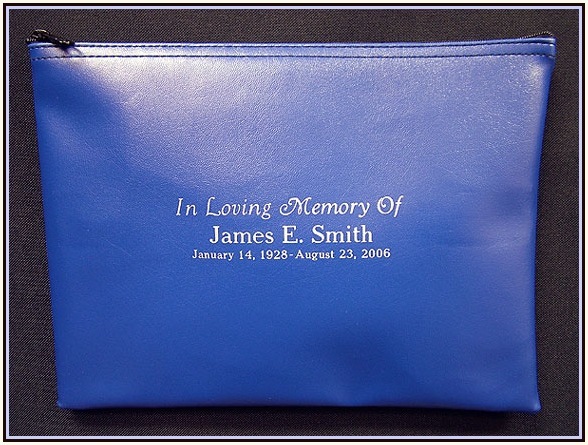 One of the biggest advantages of hot stamping is that we can print and personalize a bag (s) for one or smaller quantity orders WITHOUT a plate/setup fee. If we have the bag (s) in stock we can generally ship it the same day! It has been around for years and more than likely you have all seen it without knowing what process it was.Some very common examples would be the bright gold foil style that you may see printed with words or logo on a pack of matches, cover of a book, restaurant menu cover, wedding album, ribbons, back of your vinyl automotive insurance card cover, etc. The specialty process of this type of printing - transfer process is also used on countless thousands of applications ranging from the lettering of a control switch that may say “on or off” of a button on your vehicle dashboard to the word “bass” on your home stereo. General Information: The type styles that we use are Times New Roman & Arial- 36 & 18 point and Goudy Cursive. With “hot stamp printing” we have to set type. Therefore we have to impose limits on amount of characters and lines. We can set up to three ( 3 ) lines of text at once for a multiple bag order. WHAT IS HOT STAMP FOIL PRINTING??? 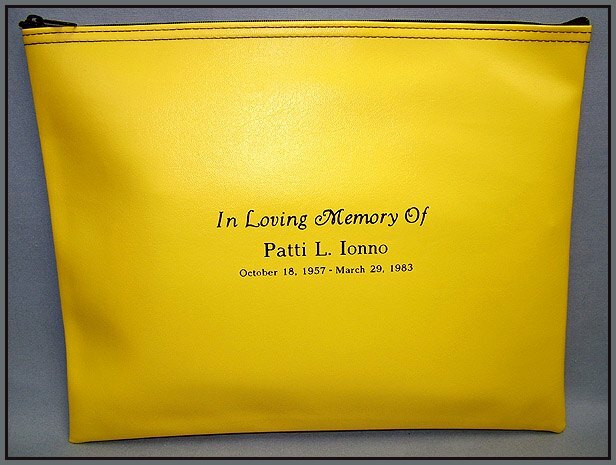 PERSONALIZATION: You can personalize any bag with your initials, name, nickname, or anything you desire. 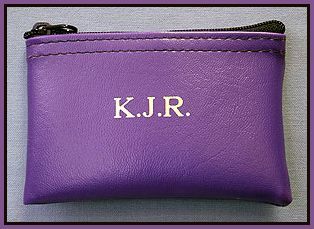 The small purple bag is our SVBB-1 ( 3-1/2"h x 5"w ) which is great for small items like credit card (s) and loose change. The hunter green bag is our very popular bag VBB-47 which can fit into your purse or can just be used as a zipper wallet. It measures 4"h x 7-1/2"w and dollar bills fit right in without folding them! Below pricing is for ONE to THREE bags of the SAME print. Please inquire about pricing for larger quantities of identical print orders. 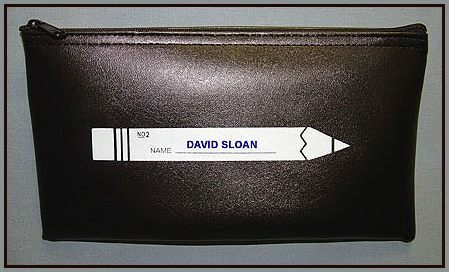 We can also personalize our VBB-611 pen-pencil bag ( or ANY vinyl bag we produce ) with your or a child's name on the bag as shown below. A direct link to those style bags and more details on them is provided ^above^. 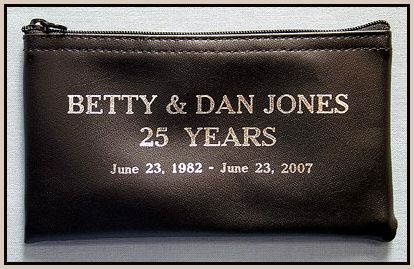 HOT STAMPING is a great inexpensive way to personalize any vinyl bag we produce to commemorate any event. This may be to pay tribute or honor a friend, loved one, pet, anyone or anything. That occasion or event that has special meaning to YOU!!! 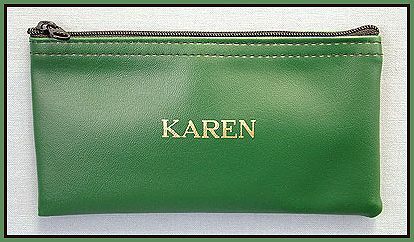 CLICK HERE for larger picture of personalized hot stamped bag.